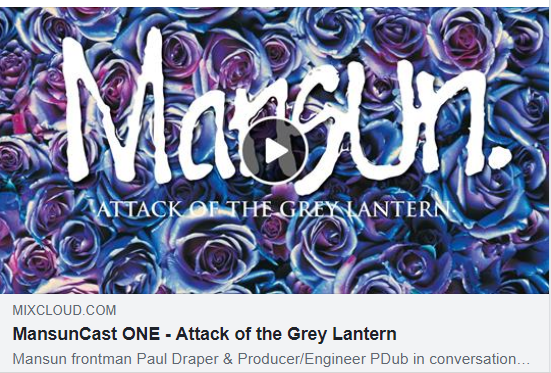 MANSUNCAST ONE: PAUL DRAPER AND MANSUN ENGINEER PDUB DISCUSS THE MAKING OF ‘ATTACK OF THE GREY LANTERN’. AVAILABLE NOW! MansunCast One, the first in a series of Mansun podcasts, is available now. In it former Mansun frontman, Paul Draper & Producer/Engineer PDub talk to Billy Reeves of BBC London, about the origins of the band, the making of ‘Attack Of The Grey Lantern’ and the task of bringing the new 21st anniversary box-set re-issue of it together. To order or stream the 21st anniversary remastered edition of this iconic album go to http://found.ee/AOTGL_21ST_ANNIVERSARY . OUT NOW!